Understanding the way in which nutrients are metabolised, and hence the principles of biochemistry, is essential for understanding the scientific basis of what we would call a healthy diet. 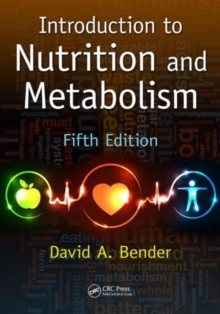 Extensively revised and updated to reflect current knowledge of nutritional and dietary requirements, Introduction to Nutrition and Metabolism, Fifth Edition presents an accessible text on the basic principles of nutrition and metabolism and the biochemistry needed for comprehending the science of nutrition. This full-color text explores the need for food and the uses to which that food is put in the body, as well as the interactions between health and diet. It describes the metabolic pathways and the biochemical basis of their nutritional and physiological importance. Topics covered include chemical reactions and catalysis by enzymes; the role of ATP; digestion and absorption of carbohydrates, fats, and proteins; issues associated with being overweight; problems of malnutrition; and vitamin and mineral requirements and functions. This new edition contains significantly expanded information on a variety of subjects including appetite control, hormone action, and integration and control of metabolism. The fifth edition also includes a list of key points at the end of each chapter. This text explains the conclusions of the experts who have deliberated on nutritional requirements, diet, and health, as well as the scientific basis for the conclusions they have reached. It also provides a foundation of scientific knowledge for the interpretation and evaluation of future advances in nutrition and health sciences. The accompanying CD-ROM contains new interactive tutorial exercises, PowerPoint presentations for each chapter, self-assessment quizzes, simulations of laboratory experiments, and a nutrient analysis program.